This will be the first time of sharing airtime on this blog. So, there will be some terms and condition for you to be qualified i.e this will be awarded to the most active commenters of MasterGBlog. I will be giving out Airtime to the most active users of this Blog who makes out time to visit and drop tangible comments on every posts published on this blog every month. However, with time, i might consider general Airtime giveaways to compensate anyone who is lucky to be online then. You can alternatively subscribe to our Web push notification via Chrome browser; See steps here. Now; i intend starting this month but there are no active members and zero comments on our posts on Science'n'Tech Blog for the month of August 2017. 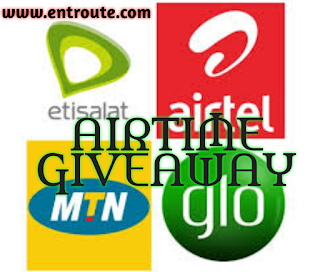 HOW CAN I JOIN THE NEXT MONTH LIST AND WIN FREE AIRTIME? It's very simple and clear. All you have to do is to comment on posts published on this blog mastergblog.com.ng. Reply to comments that you think you can answer and add value to. You might be surprised that your name will be listed on our next giveaway. PLEASE SHARE THIS POST WITH FRIENDS; DON'T BE STINGY. Thank you for reading Dan!